CRM Scanner Plug-in 2010 is a powerful tool for scanning documents right into Microsoft Dynamics CRM 4.0 entities. CRM Scanner Plug-in 2010 saves scanned documents as entity attachments in PDF format. 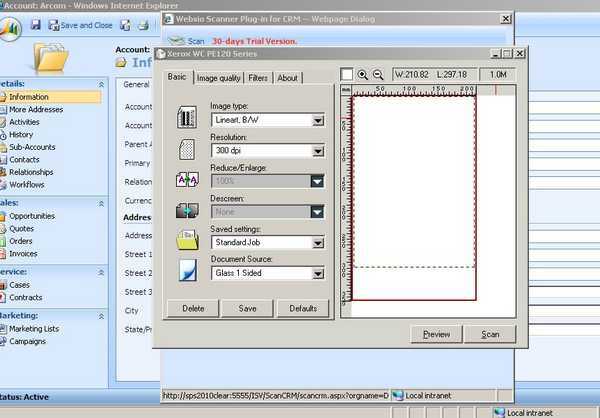 CRM Scanner Plug-in 2010 uses advanced compression technologies to enable best image quality with smallest size. CRM Scanner Plug-in 2010 supports all types of scanners: simple desktop and professional scanners with feeders. Scanner Plug-in scans documents right into Microsoft Dynamics CRM 4.0 entities. Qweas is providing links to CRM Scanner Plug-in 1.0.0 as a courtesy, and makes no representations regarding CRM Scanner Plug-in or any other applications or any information related thereto. Any questions, complaints or claims regarding this application CRM Scanner Plug-in 1.0.0 must be directed to the appropriate software vendor. You may click the publisher link of CRM Scanner Plug-in on the top of this page to get more details about the vendor.